The Wizarding World of Harry Potter offers a vast array of authentic shops seen in the Harry Potter book and film series. 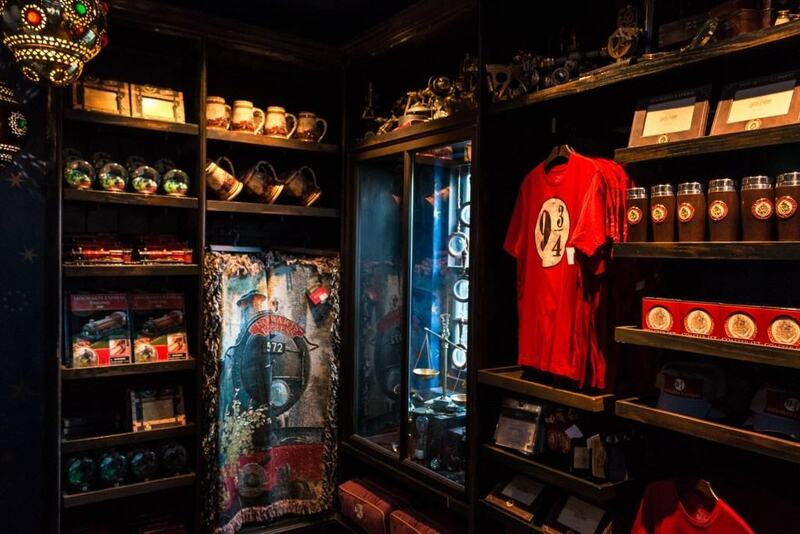 You’ll find nearly a hundred items exclusive to the Wizarding World, from interactive wands to Pygmy Puffs to genuine Hogwarts house robes. We’ve covered the seven main shops at Hogsmeade below. Keep in mind that these shops are authentically small, meaning they have tiny capacities. On busier days, team members limit the amount of people entering as the stores reach capacity. To avoid waiting in long queues, we recommend doing your shopping at the very beginning of your day or in the final hours the park is open. Important tip: Most of Ollivander’s wand boxes do not fit in the Forbidden Journey’s free lockers! All interactive wands, however, will. To avoid a dilemma, send your Ollivander’s wand box to package pickup at the entry plaza Studio Store upon purchase – just be sure to retain your wand so you can enjoy Hogsmeade’s interactive spell locations. 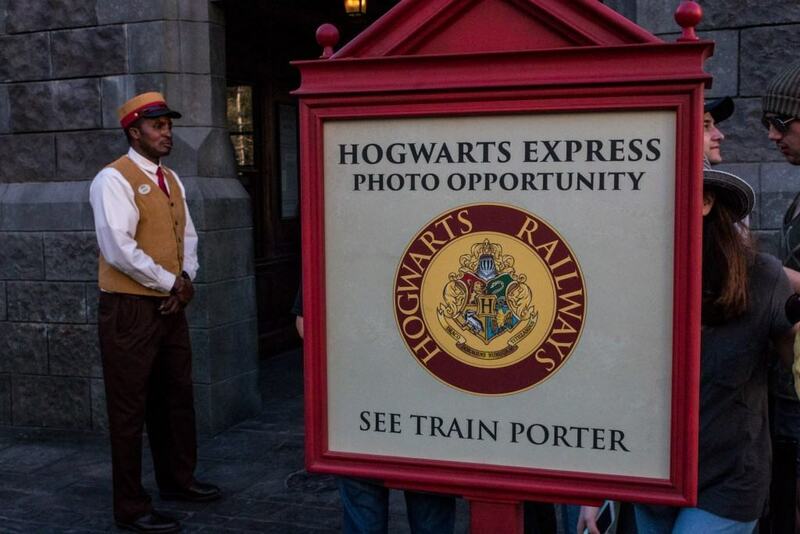 Location: To the right on the Hogsmeade main street when facing Hogwarts. The direct entrance is somewhat hidden, located on the back alley that runs parallel to the main street. The shop can be more easily accessed via Gladrag’s Wizard Wear or the Owl Post (see below). 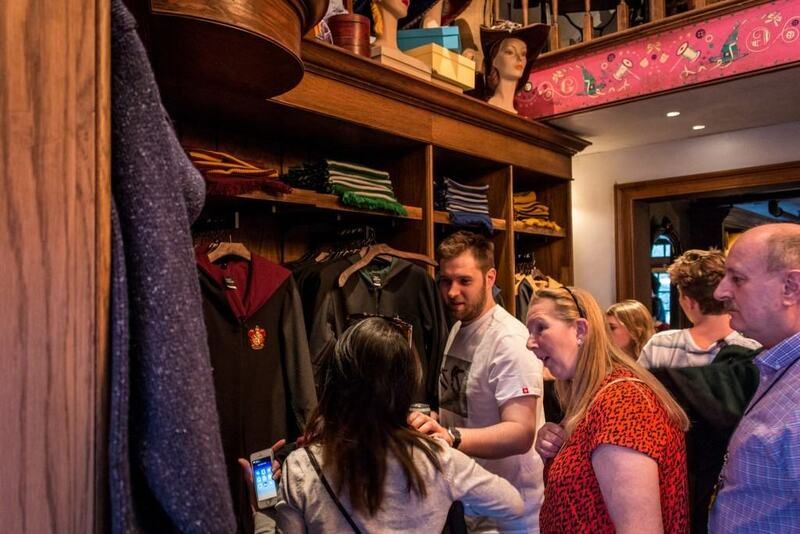 The Bottom Line: Dervish and Banges is the premiere location for Wizarding sports gear. Items pertaining to Quidditch, the Triwizard Tournament, and magical creatures are available here. Featured items include Quaffles, Bludgers, and Golden Snitches. The shop also sells Hogwarts house apparel and scarves. Look up to see animated moored brooms. A caged Book of Magical Creatures snoozes near the front of the shop, but beware – the book may bite! Location: At the base of the Hogwarts Castle mountain. Forbidden Journey riders exit into the store. The Bottom Line: Filch’s Emporium is a sort of “best of” shopping location, offering items from around the Wizarding World. Most prominent are Harry Potter-branded items, including pins, books, and DVDs. A huge array of Magical Creature plushes are available, including phoenixes, dragons, snakes, and house elves. House merchandise, including apparel, can be found here. This is also the best spot to find Dark Arts-related merchandise, including impressive Death Eater masks. You’ll also find the Marauder’s Map in a glass case; look closely, and you’ll spot several Hogwarts personalities roaming the halls. Location: To the right on the Hogsmeade main street when facing Hogwarts, between the Owl Post and the Magic Neep. Look for the Yule Ball dresses in the shop’s window. The Bottom Line: Gladrag’s Wizard Wear is a tiny store that physically connects to Dervish and Banges as well as the Owl Post. If you’re interested in (expensive) house robes, Weasley Christmas sweaters, hats, cardigans, and other high-end Hogwarts apparel, this is the place to go. This item skews expensive, with robes costing over $100 and cardigans averaging around $90. Location: To the right on the Hogsmeade main street when facing Hogwarts, just past the Hogwarts Express proper and across from the Owlery seating area. The Bottom Line: The Hogwarts Express store primarily specializes in Hogwarts Express and Platform 9 and Three-Quarters merchandise. You’ll find model trains, apparel, scarves, and other collectibles. Location: To the left on the Hogsmeade main street when facing Hogwarts, between Zonko’s Joke Shop and the Three Broomsticks. The street-side doors are exit only, so enter through the door facing The Three Broomsticks. The Bottom Line: Honeydukes features dozens of exclusive, delicious, and sugary confections straight from the the pages of Harry Potter. 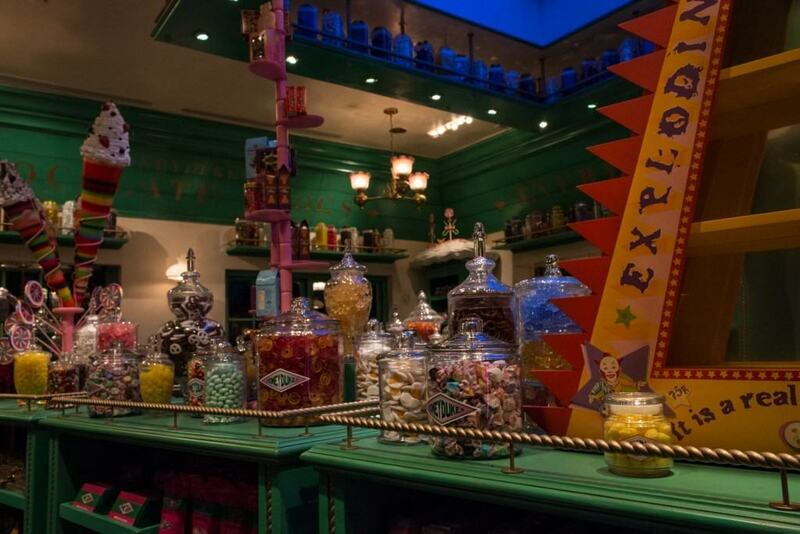 Top items include Chocolate Frogs (yes, they include the collectible famous wizard trading cards), Bertie Botts Every-Flavor Beans, Candy Cauldrons, Pepper Imps, Sherbert Lemons, Chocolate Wands, Fudge Flies, Fizzing Whizbees, Peppermint Toads, and Exploding Bonbons (phew!). For a cool reusable souvenir, consider a reusable Honeydukes glass container filled to the brim with candy. A fudge counter includes fresh Cauldron Cakes and the new Butterbeer fudge, as well as other traditional varieties. Refrigerated Pumpkin Juice and Gilly Water are also available. Candies range from $10 to $20, depending on the size and quantity. Location: To the left on the Hogsmeade main street when facing Hogwarts, adjacent to Wiseacre’s Wizarding Equipment. 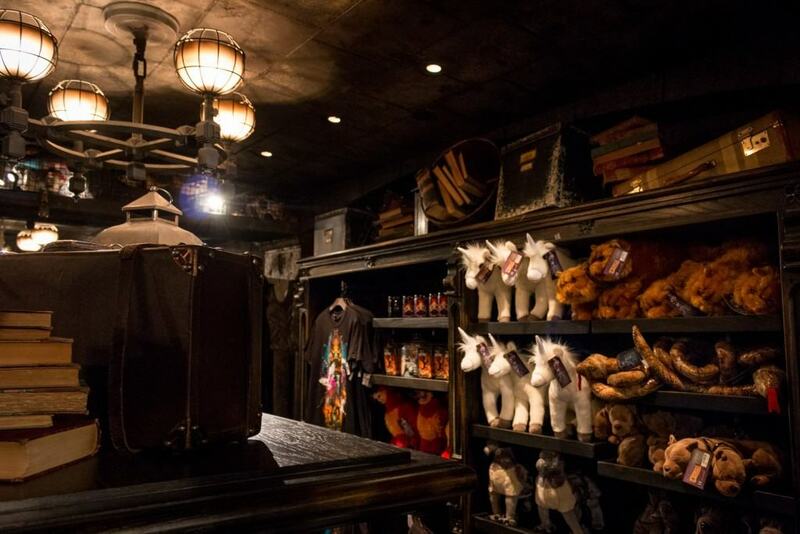 Guests who participate in the Ollivander’s Wand Shop interactive experience will exit into this store. Other guests can access it via Wiseacre’s Wizarding Equipment, across from The Magic Neep fruit cart. The Bottom Line: All wands of all varieties can be found at Ollivander’s, makers of fine wands since 382 B.C. 13 varieties of interactive “personal” wands, based on the Gaelic Calendar, can be purchased here. Several displays help you determine which wand is “yours,” with wizards and witches on hand to assist you if necessary. These interactive wands come in a display-worthy box and include a gorgeous map of Hogsmeade. The map denotes interactive spell locations where your wand can activate special “magical” effects. Interactive wands cost $49.95, plus tax. 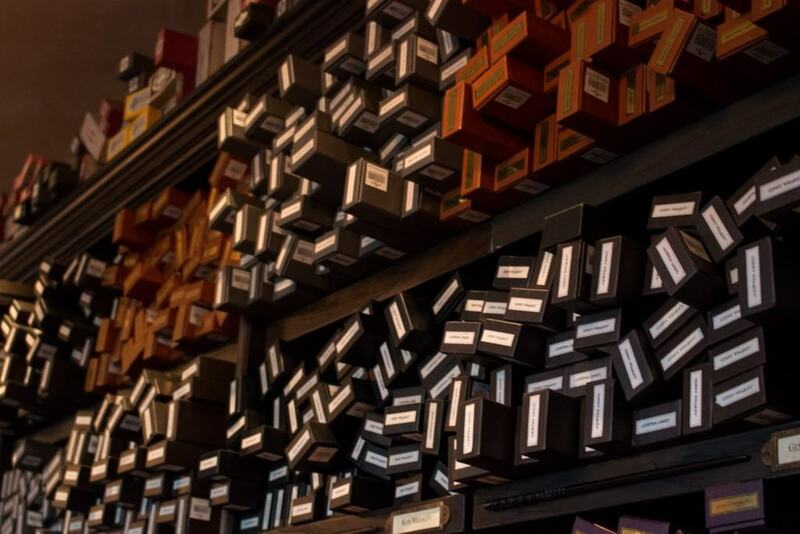 Ollivander’s also sells non-interactive character replica wands, allowing you to purchase the wands of Harry Potter, Dumbledore, Hermione, Lord Voldemort, and more. If Ollivander’s is too crowded, character interactive wands are also sold in a cart next to the entrance of Flight of the Hippogriff. Location: To the right on the Hogsmeade main street when facing Hogwarts, adjacent to Gladrag’s Wizard Wear and the Owlery. Look for the owls in the shop window. The Bottom Line: This shoebox of a store offers plush owls and stationary items. A cart just outside the shop proper sells house journals, quill pens, and ink. A “howler” can be seen in the shop’s Owlery window. Fun fact: you can actually send letters from the Wizarding World! An outgoing mailbox is located outside the Owl Post in the Owlery. Letters will be stamped with an exclusive Hogsmeade insignia. Location: To the left on the Hogsmeade main street when facing Hogwarts, across from the Magic Neep fruit cart and next to Ollivander’s Wand Shop. Look for the vivid purple storefront. The Bottom Line: Another especially small store, Wisacre’s specializes in keychains and house robes. Location: To the left on the Hogsmeade main street when facing Hogwarts, adjacent to Honeydukes. Guests must pass through Honeydukes to reach Zonko’s, as all of the building’s street-side doors are exit only. Enter on the far side of the building near the entrance to Three Broomsticks. 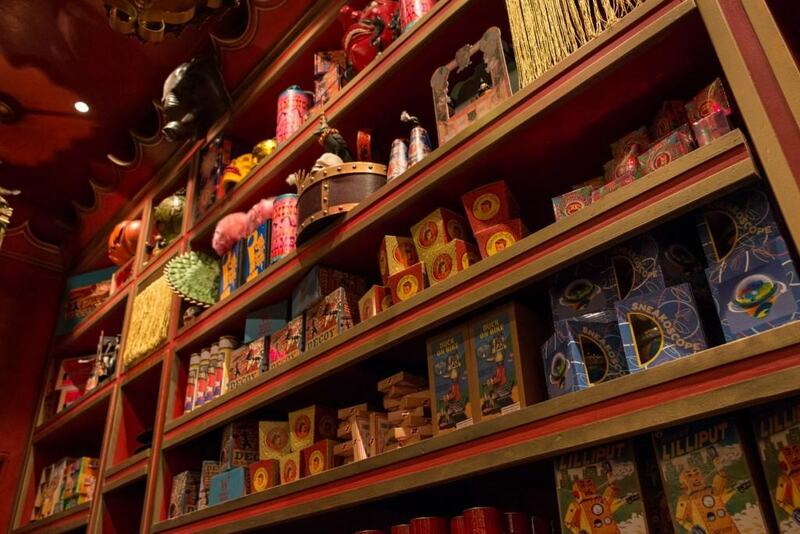 The Bottom Line: Zonko’s is the park’s only joke shop and features imports from Weasleys’ Wizard Wheezes. Featured items include love potions, Decoy Detonators, and the adorable Pygmy Puffs and related merchandise. 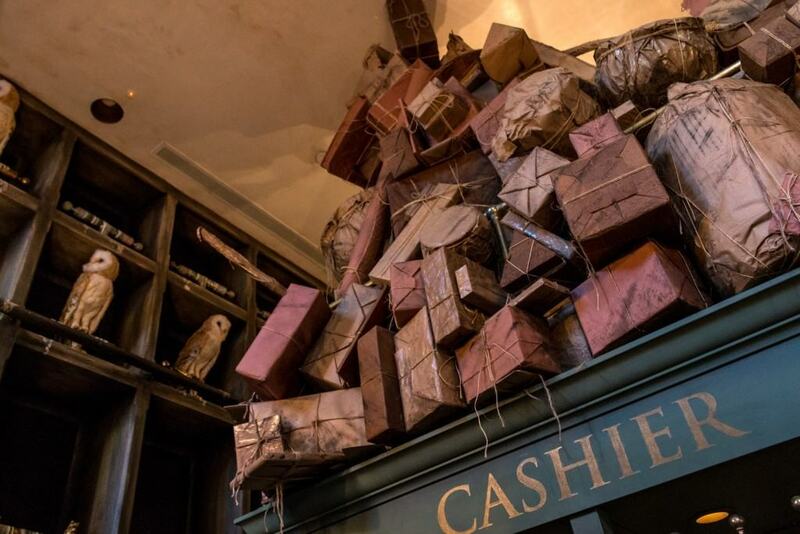 Look up and around you to spot several Wizarding World species lurking in the store’s shelves. Note that the store is much smaller than its former Orlando sister, taking up only a single wall in the Honeydukes building complex. Shopkeepers offer a naming ceremony with the purchase of any Pygmy Puff ($15).